A deck becomes where family and friends gather to BBQ, socialize or just relax and enjoy the outdoors in the warm sun or a cool Columbus, Ohio night. 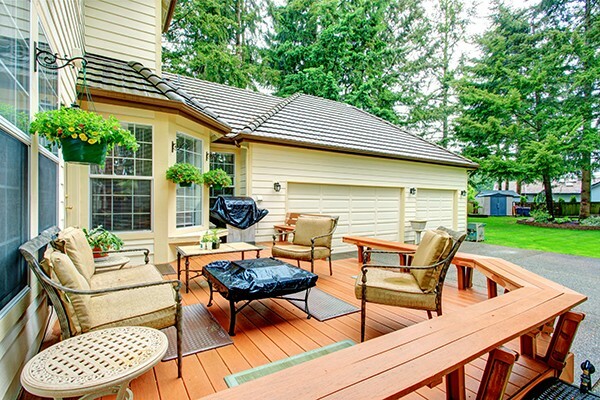 Wrap-around decks and multi-level decks can be a beautiful architectural addition to your home. Whether you want a simple place to enjoy or a unique custom design, MLH Design & Build feels your deck should be a natural extension of your home, blending with your home’s style and natural surroundings. Our decks are constructed of either wood (IPE, cumaru, cedar, mahogany, pressure treated) or composite materials (Timber Tech, Trex, Azek.) Each material has its own charm and benefits, so we can discuss which is best for you. We can finish your deck with traditional railing systems, stainless steel cable railings or create your own unique custom pattern. If you really see your outdoor area becoming another highly used living area, then ask us about screening in, closing in your deck or a portion of your deck, adding a hot tub, a Pergola or a covered roof to your design. If your deck will be the place to gather, then let’s discuss adding built-in benches (with optional storage) to make all your guests comfortable. Who says you need to go inside when the sun goes down? 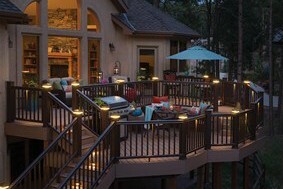 Not only does adding LED lights to your deck create a beautiful ambience, it also enhances your deck steps ensuring safety. MLH Design & Build’s high efficiency LED lighting system will extend your relaxing time or party time into the night. It started as a simple replacement of a backyard sidewalk that we installed over 20 years ago. It ended up with a complete redo of sidewalks, steps, patio, trash enclosure, and even a new front wall. Why? Because of the quality, professionalism and performance of MLH! I sincerely recommend Mike Sileargy of MLH. Mike is responsive to the customer. Mike has vision. Mike goes the extra mile. The quality of work is exceptional. Mike and his crew are hard workers. We have done extensive remodeling and home additions over the past 35 years and have worked with numerous contractors, so we speak from experience and authority. Mike is one of the very best! Mike’s customer service, follow through, and professionalism are extraordinary. We have truly appreciated that you show up when scheduled, finish in a timely manner, and follow up with any issues that need addressed. In addition, we have been very impressed with your knowledge in all areas from drainage, to plants to landscape design, etc. We now only want to use you and your crews for our work because you have more than fulfilled our expectations! We are extremely grateful.